Free Shipping Included! GT SONIC 6L Ultrasonic Cleaner Stainless Tank with 300W Heater Digital Timer Professional for Cleaning Jewellery Household Commodities Labs Glasses Coins Metal Parts (40KHz, 150W) by GT Sonic at Social Seeker. MPN: VGT-1860QT US. Hurry! Limited time offer. Offer valid only while supplies last. 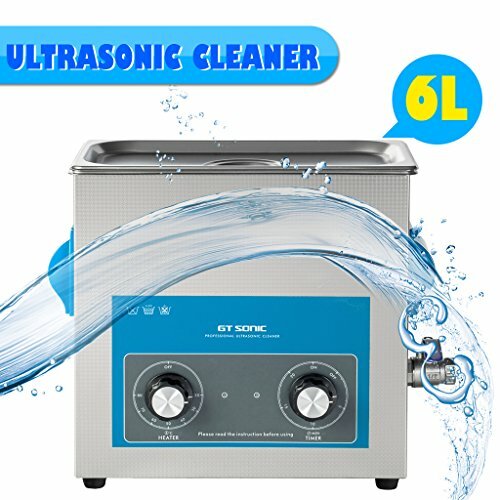 ULTRASONIC CLEANER WITH HEATER: 40KHz & 150W ultrasonic power produces millions of microscopic waves gently lift dirt, dust, smears, enhanced with 300W strong heating power ensure your jewellery valuables be shining again only plain tap water, environmental and effective. HEATING FUNCTION & DIGITAL TIMER: Simple follow TEMP and TIME Switch ON/OFF and set up cleaning missions with adjustable temperature setting 20-80 Celsius & 1-20 minutes digital timer. LARGE CAPACITY STAINLESS STEEL TANK: Strong and durable SUS 304 stainless steel tank with large capacity 6 Liter /202 oz [ 11.8''(L)X6.1''(W)X5.9''(H) inch], along with a removable basket to protect targets and cleaner both from damaging. 60 DAYS MONEY BACK & 18 MONTHS EXCHANGE: We guarantee you'll love this cleaner and if you aren't absolutely satisfied, returned it within 60 days for a full refund, no questions asked. If you have any questions about this product by GT Sonic, contact us by completing and submitting the form below. If you are looking for a specif part number, please include it with your message.